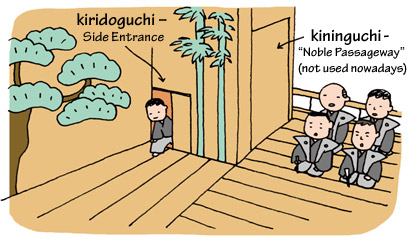 TRIVIA of Noh : Q62 : Is there a third passageway in on a Noh stage? | Home | Trivia | Q62 : Is there a third passageway in on a Noh stage? Is there a third passageway in on a Noh stage? To enter and exit from a Noh stage, there is a passageway known as the kiridoguchi to the side of the curtain entrance at the far side of the hashigakari. The kiridoguchi is a sliding door to the far right side of the atoza, across from the hashigakari, more than one metre tall and slightly more than one metre wide. The outside of the door, which one cannot pass through without kneeling, is one level lower than the stage. The jiutaikata and kōken enter and exit from the kiridoguchi, and performers who have completed their role in a play also exit the stage from here. The performers of shimai and maihayashi also use the kiridoguchi to enter and exit. The staff of the gakuya or other actors not entering the stage will open and close the door, but the actor entering or exiting never touches the door. The kiridoguchi of course did not exist as part of the stage in the days when there was no kagamiita or yokohameita. The kiridoguchi is also known as the okubyōguchi, or “door of cowardice,” as this was where actors playing wounded warriors would exit the stage, and as the wasureguchi, or “forgotten door,” as it is far from the audience and thus difficult to see. There is actually a third passageway in the wall to the far side of the seating area of the jitutaikata, known as the kininguchi, or “noble passageway,” which was used by actors of high standing in the past to enter the stage without bowing their heads. Modern-day Noh actors do not use the kininguchi.